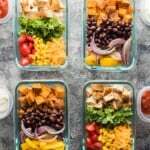 These mix & match meal prep burrito bowls will help you make four delicious lunches using what you have on hand in your pantry and fridge. Another recipe from our April Lunch Prep Challenge! I have to say, given that I was going through some rough morning sickness while testing these recipes, I was really happy with how they all tasted in the end. And these burrito bowls ended up as one of the participant favorites. For our Lunch Prep Challenge, my goal was to create recipes that you can ‘make your own’. Loose recipes. Easily gluten-free-ified and veganized. And this is one such recipe! Or ‘loose concept of a recipe’. A ‘clean out the fridge’ kind of meal prep! So today, for these mix and match meal prep burrito bowls, I’m giving you lotttts of options. Burrito bowl components: a) rice b) proteins c) veggies d) salsa/sour cream/sauce of choice. 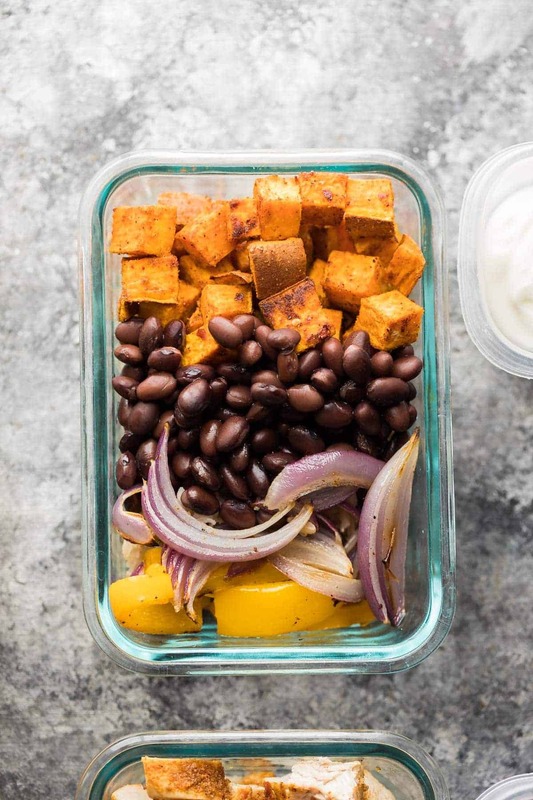 These two versions are: chicken burrito bowls and black bean sweet potato burrito bowls, but by all means, tweak this formula with what you have on hand to get your perfect burrito bowl. The flavor in these meal prep burrito bowls comes from a simple spice rub you throw together. I split the rub and put half of it in the rice as it cooks up, and smothered half of it on the chicken or sweet potatoes as they roast. It’s a bit spicy, so if you don’t like spice, leave out the red pepper flakes. For veggies, take a peak in your fridge and go nuts. I used kale/romaine lettuce, cherry tomatoes, and corn kernels for my chicken version, and added a sprinkling of cheese as well. For the vegan version, I roasted up some sweet potatoes, red onion and bell pepper. You could pair these with the chicken or with the black beans. For the sauce, pick your favorite! I used salsa and greek yogurt, but I bet an avocado dressing or guacamole would also be amazing. 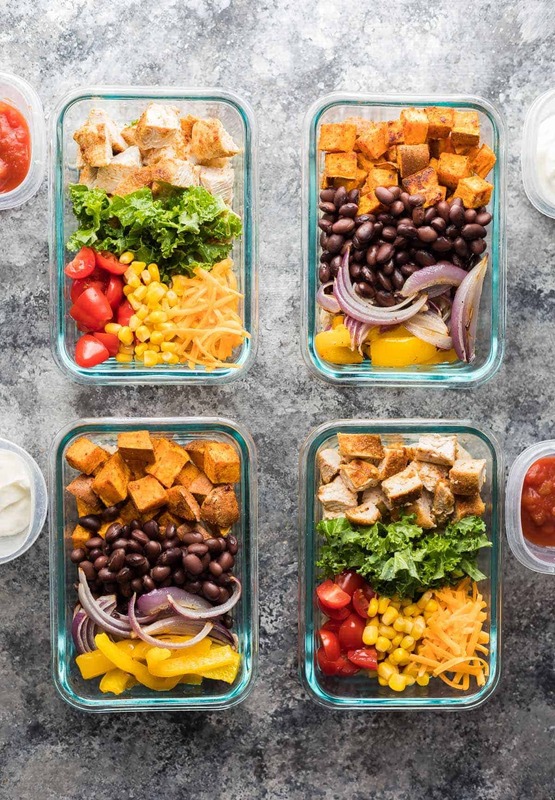 And for those of you with a little extra time and wanting more variation in your lunches for the week, you could split it up and do two of each version! Chicken Burrito BowlsStir together the rub and add half to the rice with cooking liquid. Cook rice according to package directions and allow to cool. Heat oven to 425°F. Toss chicken in olive oil, then sprinkle with the remaining rub and toss to coat evenly. Arrange the chicken on a baking sheet and bake for 10 minutes. Flip, then bake for another 10-15 minutes, until cooked through. 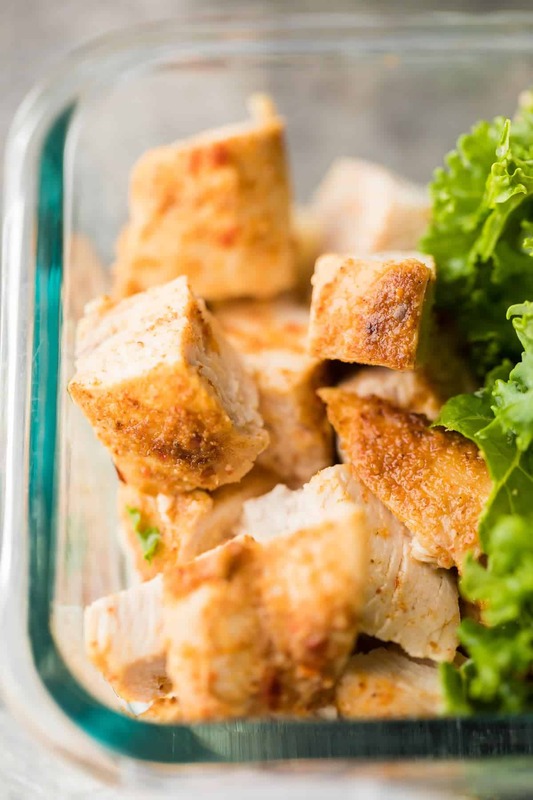 Allow chicken to cool and chop into cubes. While chicken is baking, prepare the veggies and cheese. To assemble, divide all ingredients between 4 2-cup capacity storage containers. Store salsa in a separate container and add to the burrito bowls just before serving. Sweet Potato Burrito BowlsStir together the rub and add half to the rice with cooking liquid. Cook rice according to package directions and allow to cool. Heat oven to 425°F. Toss sweet potato cubes in 1 tablespoon olive oil and spice rub, then arrange on a large baking sheet. While sweet potatoes are roasting, prepare the onion and bell pepper slices. Toss in remaining 0.5 tablespoon of olive oil, and arrange on a second baking sheet. When the 10 minutes is up, flip the sweet potatoes, and add the bell peppers and onion baking pan to the oven. Bake for another 15 minutes. Allow veggies to cool before assembling. To assemble, divide all ingredients evenly amongst 4 2-cup capacity storage containers. Keep the greek yogurt in a separate small container, until you are ready to serve. 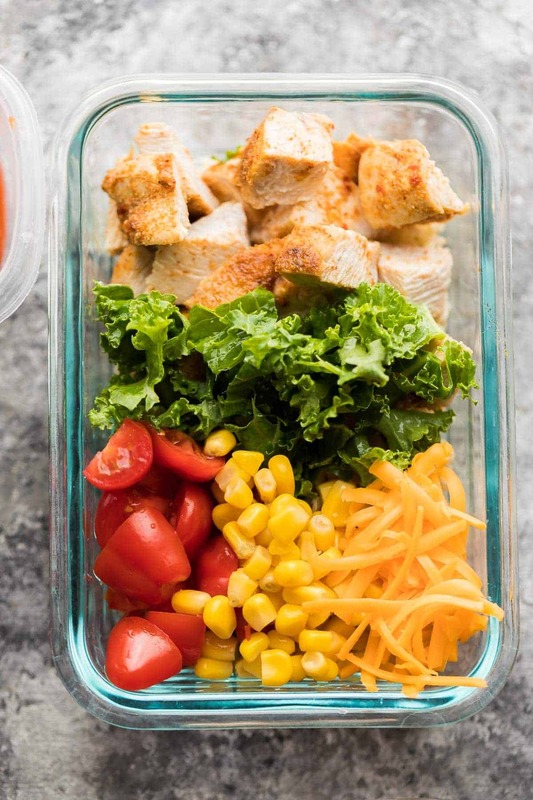 Both the chicken and sweet potato burrito bowls may be stored in the fridge for up to 4 days. You may wish to mix completely and heat gently, or they can be served cold. I want the black bean/sweet potato recipe BUT it is not vega, it uses dairy, which is not included in a vegan diet. Are there any substitutes for the dairy? Thanks! Hi Bettie, yes, you can easily swap the yogurt suggested for serving for coconut yogurt. Hope you enjoy! Hey CC, obviously the chicken burrito bowls are NOT vegan. The black bean and roasted sweet potato burrito bowls are vegan.